CONGRATULATIONS!! I HAVE YOUR FLIP PAL FOR YOU! this raffle raised a whopping $460 for Charity Wings! we try to do raffles every month and all of the money goes to supporting us so we can support you! HAPPY CHRISTMAS AND THANK YOU SO MUCH FOR YOUR SUPPORT! Remember this post and this one, about Charity Wings Live at CHA event. We could use a few volunteers to help us out on January 29, 30 and 31. You would work at the Charity Wings booth handing out brochures and greeting attendees. Help with Make-n-Takes and greet attendees at the Wescott booth guiding . Walk the floor with Elena assisting Elena with networking. Work four hour shifts moderating the internet room - shifts will also require checking attendees against sign-up lists and insuring they have paid to be there. Win a Flip-Pal Mobile Scanner! Each month we have an amazing raffle to raise money so that we can continue to do what we do and support Creative Minds in their efforts to give! drawing to be held December 21st just in time for Christmas! Want to see what the flip pal can do? And another free bonus ticket if you leave a comment on Elena's Blog! You must purchase tickets to receive the free bonus tickets. To purchase 5 tickets for $20 click here and scroll to the bottom of the page. To purchase 1 ticket for $5 click here. We are raffling off a Flip-Pal Mobile Scanner! for just $5 a ticket! Do you remember the Live at CHA event I talked about in this post? I just wanted to give you a reminder to give a gentle (or not so gentle) nudge to Santa Claus to put our CHA event in your stocking. The first 300 registrants will receive an awesome swag bag containing products from our wonderful sponsors! And who knows, there may be even more sponsors!!! With your paid registration of $48, you will receive a bag of make and takes and other goodies worth over $50! Plus, you’ll be able to join Elena and Sheila as they talk to leaders in the scrapbook industry, including Unity Stamp Company, Jenni Bowlin, Teresa Collins, The Girls Paperie, Tattered Angels, Bazill, Creative Imaginations, My Minds Eye, Prima, Donna Salazar and more!! You never know who’ll stop by! That alone is worth the registration fee!!! Manufacturers will also donate items that will then be auctioned on eBay. All proceeds will be donated to Crops of Luv. Crops of Luv organizes crops where participants create memory books for the families of children with life threatening illnesses. You can bid on the new releases and all profits will go to Crops of Luv! Stay tuned for more announcements over the next few weeks!!! Click here to register for this exciting event!!! How would you like to see Elena on the Ellen Degeneres Show? Wouldn’t that be a great bit of publicity for our endeavor. Go to the Ellen Degeneres website here and tell Ellen why you think Elena should be on the show! Simple as that!!! Wouldn’t it be great to say we new Elena before she got rich and famous? Did you know that Charity Wings/Scrapbook Royalty has a store on the website? Well, we do and newly listed are these beautiful purse/tote hooks!!! Wouldn’t these be wonderful to keep your gear withing reach at a crop? Click on the photo if you’re interested. 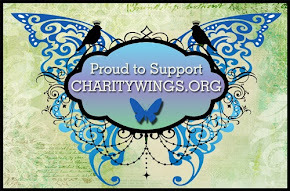 Using goodsearch.com to make your on-line purchases, will give you the chance to donate a percentage of your purchases to Scrapbook Royalty/Charity Wings. Third - They'll donate to your specific cause with every search! If you already use goodsearch.com, know that you can, in fact, donate to multiple causes. Only catch is...you can only do one-at-time. So perhaps you could designate specific days to specific causes! You can change the designated organization by clicking on the yellow "clear selection" box and then typing in the name of the new organization. Best part....doing this is free to you and it's year-round! Our sweet Elena . . .
. . . has been featured on THIS BLOG! Go check it out and leave Elena some love! Do you have your Christmas shopping done? If your like me, you don’t and you don’t really want to go out to the mall. I live in a city (Boise, Idaho) where the greater area population is close to 400,000 people and we have one mall. Can you believe that? At this time of year you don’t even want to go near there!!! So, how about we make our trip to the mall a dual purpose. Let’s spread some kindness while we’re shopping. Just before Thanksgiving, the Brave Girls Club issued a Words of Kindness Challenge. What better time to spread truth and kindness than during the holiday season. Please click on the picture to read all about it but I’ll give you a synopsis. Print out these messages and pass them out while you are shopping. You won’t believe the responses you get. When I see someone walking down the isle, obviously preoccupied, I’ll hand them one of these beautiful truths. You can see in there eyes that it was just the thing the needed to make there day. Now, listen to this message by Melody Ross, co-founder of the Brave Girls Club. Plus, I love this video of a family spreading words of kindness. Watch it all the way through—that last kid is great!!! You can do this too!!! Now, go forth and spread some kindness!!! Have you ever wondered what Club Royalty is all about. I know I have so, here’s the scoop! Club Royalty is all about charity, crafting and sharing. Its about using our creative endeavors to tie them all together. It’s a club of Charitable Crafters! Crafting. What better way to remember your charitable deeds than to create something about your experience. You can share photos or journal about your experience and then create something to document your charitable act. How about creating a scrapbook page, quilt, video, collage, etc. They skies the limit!!! Sharing. If you would like, you can share your creations with the club. You can upload a photo of your creation to the gallery. The amazing manufacturers, artists and scrapbook stores that support Scrapbook Royalty have donated some amazing prizes to be given away each month! We will randomly choose as many winners as we can! There will be lots of other perks. Special manufacturer discounts just for members. Special video tutorials from amazing artists when they share their charitable acts and their creations. An online forum on the SBR website just for Club Royalty members to connect, share their stories and encourage each other's volunteer efforts. Other special bonuses throughout the year. To join, just make a $20 donation per 3 month cycle. You can do as much or as little as you want. If all you want to do is donate the $20, that’s okay. We’ll be eternally grateful! The cost to join is just a small $20 donation per cycle. There is no commitment, there are no requirements. You can do as little or as much as you want. If you just want to donate $20 per cycle we are grateful for that too! …and even if you’re not, you are going to love these sets illustrated by Melody Ross for Unity exclusively for Scrapbook Royalty. Aren’t they beautiful? I know I love both of these sets! Wouldn’t these images be perfect for cardmaking or on your scrapbook pages? So, head right on over here and purchase one or both sets now!!! It all goes to a great cause! What are you waiting for, go, now!! !